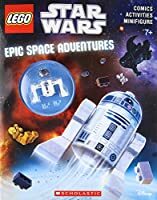 An all-new LEGO STAR WARS Activity Book featuring an R2-D2 minifigure with 32 pages of hilarious activities! Relive all of the humor and action of LEGO Star Wars in this fun-filled activity book! Includes mazes, matching, code-breaking, puzzles, and more!